Two selections from our Sommelier released every other month. Choose mixed, reds whites or sweets only. We will process your credit card the day of the allocation date for approximately $45-$55 (based on selection). Complimentary Wine Tasting for yourself and one guest each time you visit. Additional guests receive 20% off our regular tasting fee (excluding special events). • 30% discount on cases of wine. • 20% discount on bottles of wine. • 20% discount on merchandise. 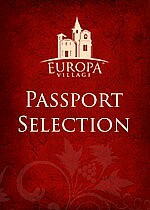 • 20% discount on accommodations at The INN at Europa Village. • 10% discount on our special ticketed events. • 10% discount on private functions (excluding weddings). • 25% discount on re-orders of current Passport of Première Club selections.